Rope Types for Boat Lines. 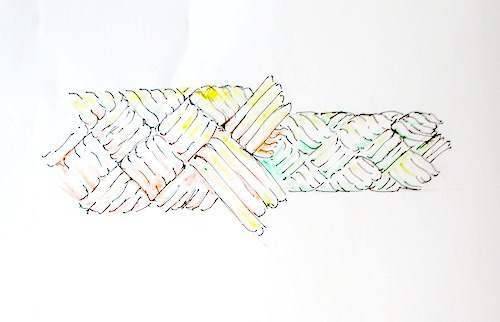 Boating rope types or lines, as us boaters prefer to call them, come in several different types of construction as well as sizes and materials. It is the construction of the line as well as the material it is made from that will determine its strength and its uses. So, when is it best to use braided lines and where would three strand be better? And why is the type of construction material important? Natural fibre rope has almost entirely been replaced by modern synthetics because of their superior strength and durability. Save yourself money by choosing the right types for you boat. For most of us the main types of synthetic materials used for boat ropes are nylon, Dacron, polyethylene and polypropylene. For mooring and anchoring lines some stretch or give is beneficial but for most rigging lines on a sail boat, it is best to minimise stretch. Many of the more expensive blends of synthetic fibres, such as Dyneema, Kevlar, Technora and Vectran used on racing sail boats are designed to minimise stretch. But beware if you are considering upgrading, using some of these hi-tec. ropes might require replacing your deck gear. Ropes are made by twisting the fibres, whether natural or synthetic, into yarns and then twisting the yarns together to form strands. The strands are then twisted, plaited or braided together to form the line or rope. Three strand or ‘Plain laid’ lines can be made with the three strands twisted either to the left or the right. The direction of the twist determines the ‘lay’ of the rope. However, the majority of these lines are right laid. These right handed laid lines can also be called hawsers and the clockwise lay referred to as ‘hawser laid’. The process begins by spinning the yarns left handed into strands, then the strands spun right handed to make the line. 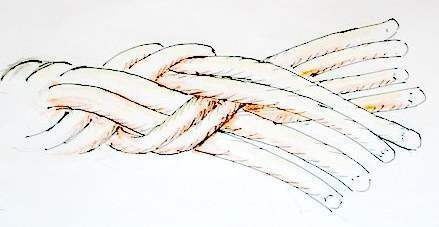 Occasionally three or more lines may be twisted together to make a large mooring cable, these will be spun left handed and referred to as ‘cable laid’. 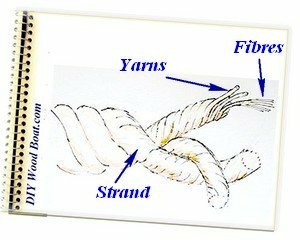 Three strand lines with their stretchiness are fine for docking and mooring and are easy to splice. Platted lines are made using eight strands platted together in pairs. Four of the strands will have a left handed lay the other four will be twisted to the right. These are then paired and plaited together. Plaited and multi-plat rope types are ideal for mooring and anchoring due to their strength and stretch. Braided lines come in different construction types such as hollow-braided, stuffer-braided, solid-braided and double braided or braid on braid. They are usually made by platting or braiding together groups of three strands to form the ‘sheath’. A sheath is usually made up from 16 strands which encases a ‘core’. 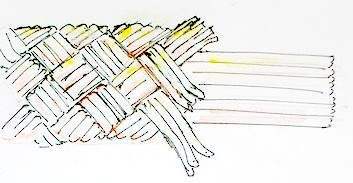 Cores can be made up from fibres laid parallel, twisted or plaited. Where the core is plaited the line is known as braid on braid. The most common type of braided line is double braided nylon. Double braid, has a braided core tightly encased within a braided cover which in turn is encased with in a braided sheath. This unique rope type construction provides superior strength, 50% of which comes from the core, plus abrasion protection afforded by the outer sheath. Used mainly for running rigging due to their low stretch and the outer cover that makes for handling comfort. It is possible to use some of these modern ropes such as Spectra™ as an alternative to stainless steel for standing rigging. While they provide an enormous weight advantage and can be simpler to rig, there are downsides. There is a greater risk of chafe and UV degradation than with stainless steel.